Stunning Panoramic Ocean Views from Beachfront Penthouse. 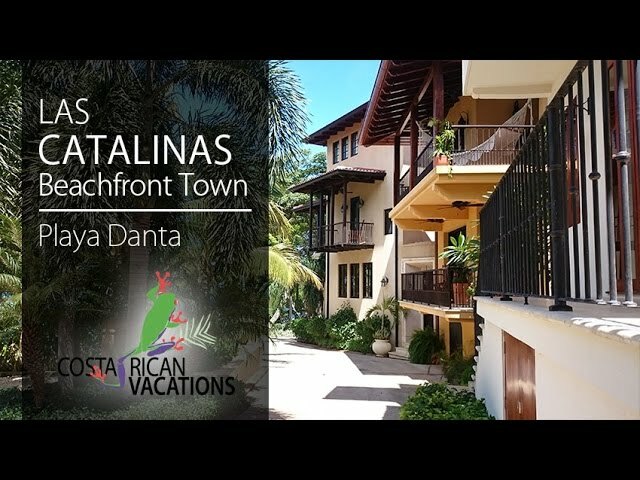 The fantasy of a beachfront penthouse with million dollar views can be yours in Las Catalinas, a walkable community in Guanacaste, Costa Rica. Casa 41 Plaza Central is a three-bedroom rental that is perfect for families or friends, up to six people. Although you’ll be steps away from the beach at Playa Danta, you may not be able to peel yourself away from the sunsets you’ll see through the large windows and off the multiple balconies. Want to enjoy a drink or meal in front of those incredible ocean views? The fully equipped modern kitchen will have all you need to prepare the best. You can also take advantage of the dining room, which has its own views of the waves, or you could relax in front of the 48″ television in the living room. All three bedrooms have private bathrooms, air conditioning, and ceiling fans, but beyond that each room is unique. The master offers a King, a private terrace, and floor-to-ceiling windows. Both guest bedroom have Queen beds, one with views of the mountains and the other with two private balconies. One of guests’ favorite aspects of all rental homes in Las Catalinas is the complimentary ¨House Mom¨ service, which includes breakfast prepared daily with ingredients found at home or what the Concierge Team has purchased prior to arrival.